The Nintendo 3DS is by no means an unsuccessful handheld console. Over the course of its lifetime it’s sold over 60 million units worldwide, and its also played host to fastest-selling Nintendo game ever in the US with Pokemon Sun and Moon. But there’s a consistent sense the dedicated gaming handheld is on the wane thanks to the rise of smartphone gaming. The 3DS’s sales are currently dwarfed by both those of the previous-generation Nintendo DS and PSP. This has lead to speculation about the death of the handheld line, and now Nintendo has confirmed that, for the time being at least, it’s not working on a follow-up. In an interview with Time the company’s president Tatsumi Kimishima confirmed that the company is not currently working on a dual-screen successor to the 3DS right now (although he didn’t rule out the possibility of one appearing eventually). So we’re not going to get a new 3DS anytime soon, but it’s hard to ignore the fact that the upcoming Nintendo Switch is starting to look a lot like a follow-up. Although battery life concerns have lead to many dismissing the Nintendo Switch’s potential handheld capabilities, what many people are ignoring is that the new console has a very similar battery life to the existing 3DS. 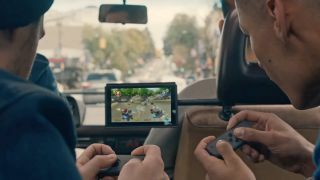 Nintendo is claiming that the battery life on the Switch is anywhere from two and half to six hours, while the battery life of the original 3DS was between three and five hours. Two and a half hours is definitely short, but outside of worst case scenarios, the Switch should otherwise get a comparable amount of playtime as the 3DS. Then there’s the fact that Nintendo has said that it’ll continue to support the 3DS past the launch of the Switch, which some have taken as an indication that the Switch isn’t replacing the handheld but this ignores the fact that every console has continued to be supported after the launch of its successor. For example, the PS3 continued to see support after the PS4 launch, and in turn the PS2 saw releases until 2013, a whole seven years after the PS3 was first released. With no follow-up to the 3DS on the way, and with the Switch matching it in terms of battery life, it’s hard not to see it as eventually replacing Nintendo’s 3D handheld - albeit with a single, rather than a dual screen experience. Check out everything we know about the Nintendo Switch's release date news and features.